Fred McKinnon, a pianist and composer from St. Simons Island, Georgia, has recently been welcomed onto the official artist roster for Whisperings Solo Piano Radio. Whisperings features the biggest names in solo piano music, with over 300 represented piano artists. The collective was founded by David Nevue, an incredibly successful solo piano artist from Oregon, USA. David Nevue and the Whisperings Solo Piano Radio were recently featured in a fascinating story about the genre of solo piano music in Rolling Stones Magazine. “It’s a great honor to be added to the roster at Whisperings Solo Piano Radio. I’ve known David Nevue for years and have always been a huge fan of his music. The talent displayed within this roster of solo piano artists is vast and I’m humbled to be included. 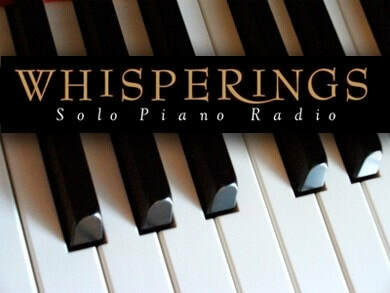 Now, after fifteen years “on the air,” Whisperings: Solo Piano Radio is home to over 340 talented piano artists and broadcasts to tens of thousands of piano music fans from all over the world every day. The program offers both a free stream that is supported by advertising and a premium stream with no advertising and customizable features for the listener. Fred McKinnon has been creating instrumental music for years. His first album, “QuietTimes Keyboard Instrumental” was recorded in his college apartment with a single keyboard and sold thousands of copies. The following year, “QuietTimes” Volume 2 was released which featured Fred McKinnon on keyboards and his friend, Deutsch (Dutch) Heidler on saxophone. These two albums were designed to provide continuous play instrumental music for prayer, quiet time, and devotion. In the Fall of 1998, Fred released his first solo piano album, “Be Glorified“. This album features cover arrangements of some of the classic praise and worship songs such as “As The Deer”, “Holy and Anointed One”, “I Am The God That Healeth Thee”, and others. This is still one of Fred’s best selling and streaming albums of all time. After releasing “Be Glorified” in 1998, Fred’s life got very busy working in churches and running several internet-based businesses. He did record his first (and only, thus far) live praise and worship album in 2005, “Worship Under the Stars” – a dynamic praise and worship album recorded on Jekyll Island, Georgia. Although he was making music daily in his role as a church musician, the recording stopped. Then in February of 2017, Fred began to record and release his own improvisational interludes that came out of his morning devotions as the “Worship Interludes” podcast. This podcast is currently being downloaded over 1,000 times per day by listeners across more than 260 countries in the world. In 2017, Fred released his forth album, “Worship Interludes Volume 1” which was his second official solo piano album. This was a compilation of some of his favorite interludes that were released on the podcast over the previous year. After serving as a Worship Leader and Music Director in the local church for more than 24 years, Fred’s season as a staff church musician ended in the Fall of 2018. He felt strongly that this next season of his life would be focused on his gifts as a pianist and composer. In December of 2018, Fred released his first Christmas album, “Silent Night”. The Christmas album enjoyed immediate success, charting in iTunes Holiday Charts Top 50, Top 100, and on Billboard Magazine’s “New Age” chart. Despite having communicated with David Nevue for more than a decade, Fred’s piano music had never really found it’s way into his ears. With all of the changes in Fred’s life in the Fall of 2018, David and Fred reconnected and from that moment, Fred was invited to attend the annual Whisperings Concert Weekend in Atlanta, GA as an artist. Each year, dozens of Whisperings artists gather for the annual Whisperings Solo Piano All-Star Concert Weekend, where 30 artists perform across two shows and the “Whisperings Album of the Year” trophy is awarded. This year’s weekend will be hosted in Atlanta, Georgia. The Solo Piano “Discovery” Concert features both up and coming and established piano artists in a very intimate setting on Saturday, February 9th. The “All Star” Concert will be on Sunday, February 10th, and is considered the Solo Piano Concert of the Year! The 2019 “All Star Concert” will be featuring performances by Philip Wesley, Christine Brown, Stanton Lanier, Masako, Wayne Gratz, Michael Allen Harrison, David Nevue, Joe Bongiorno, Joe Yamada PLUS the Nominees for Whisperings Album of the Year…. Adam Andrews, Mary Lydia Ryan, Michael Martinez, Matthew Mayer, Robin Spielberg, William Ogmundson and Michael Logozar! Dozens of Whisperings artists will be present at the event to meet in person. The Album of the Year will be awarded at the end of the show! Come and join us for an exciting evening of solo piano “All Star” performances! For tickets to this weekend event, visit SoloPianoRadio.Com. Apple Music, iTunes, Spotify, Pandora, Amazon Music, Google Play Music, YouTube, and many more. His “Worship Interludes” podcast is available on all podcasting platforms. For more information, visit FredMcKinnon.Com. Well, GLORY, to God. This is an exciting opportunity for a.dear friend who is trained, gifted and anointed. Thanks so much Miss Anne, you’ve been a part of the journey for a long time. Love you all! This is totally amazing! I remember when my little brother started taking piano lessons, and have watched his anointing and calling be made evident and grow as time has gone by. I know all the listeners will be blessed by his gift.